Visit the Law Editor Learning Center! We’re pleased to announce the Law Editor Learning Center — a one-stop shop for law editors who want to hone their knowledge of how to use Scholastica and, in turn, improve their experience putting their volume together! The Law Editor Learning Center is a series of how-to guides and training videos that covers everything law review editors need to know about Scholastica to have the best article selection experience possible. Click here to visit the Law Editor Learning Center. When you’re a busy law student AND a law editor AND in a variety of student groups, figuring out how to best use unfamiliar software on your own is the last thing you want to do. We created the Law Editor Learning Center to do the heavy lifting for you. The Learning Center’s video tutorials (see example above) will walk you through all the basics of running a law review on Scholastica. Visit the Learning Center throughout your e-board tenure for quick overviews of everything you need to know - from when you’re first elected to law review to when you pass on the reins to the next editors. If your board is getting ready to transition, be sure to watch our video on how to transfer your Scholastica account to your new e-board. 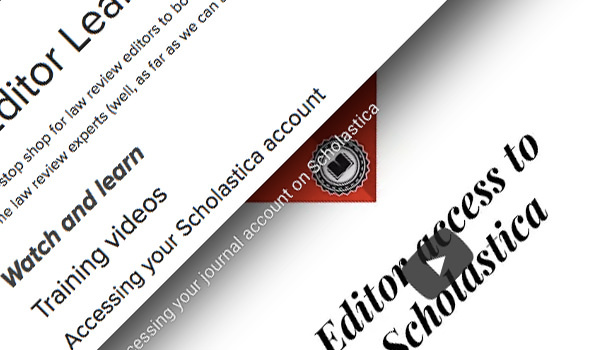 If you’ve already transitioned, skim through the videos and help docs to learn more about how to use Scholastica this year! We work with over 400 law reviews, so we were able to put together a list of the questions that we hear most frequently. If you have a question that you don’t see on the list, please email us at support@scholasticahq.com! We’d be happy to help. The Law Editor Learning Center features a list of help documents we handpicked for law editors based on the Scholastica features they most commonly use. Our help documents include step-by-step instructions as well as helpful images and .gifs to walk you through the ‘how-tos’ of using Scholastica. You can access the Law Editor Learning Center at any time, without needing to login to Scholastica (psst…so share it with your next e-board early!). Just go directly to the link here: Law Editor Learning Center. For more information about how to access and use the Law Editor Learning Center, or to suggest topics you’d like to see us cover, please reach out to us at support@scholasticahq.com! Have you considered why you should be sending decisions for all articles? Here are 5 reasons your law review should prioritize sending rejection emails.